Milton Friedman (1912-2006) was an American economist who received the 1976 Nobel Memorial Prize in Economic Sciences for his research on consumption analysis, monetary history and theory, and the complexity of stabilization policy. o The world runs on individuals pursuing their self interests. The great achievements of civilization have not come from government bureaus. Einstein didn’t construct his theory under order from a, from a bureaucrat. Henry Ford didn’t revolutionize the automobile industry that way. o Inflation is taxation without legislation. o And what does reward virtue? You think the communist commissar rewards virtue? You think a Hitler rewards virtue? You think, excuse me, if you’ll pardon me, American presidents reward virtue? Do they choose their appointees on the basis of the virtue of the people appointed or on the basis of their political clout? o The problem of social organization is how to set up an arrangement under which greed will do the least harm. Capitalism is that kind of a system. o We have a system that increasingly taxes work and subsidizes nonwork. o Many people want the government to protect the consumer. A much more urgent problem is to protect the consumer from the government. o Every friend of freedom must be as revolted as I am by the prospect of turning the United States into an armed camp, by the vision of jails filled with casual drug users and of an army of enforcers empowered to invade the liberty of citizens on slight evidence. o The most important ways in which I think the Internet will affect the big issue is that it will make it more difficult for government to collect taxes. o Well first of all, tell me, is there some society you know of that doesn’t run on greed? You think Russia doesn’t run on greed? You think China doesn’t run on greed? What is greed? o Most economic fallacies derive from the tendency to assume that there is a fixed pie, that one party can gain only at the expense of another. o History suggests that capitalism is a necessary condition for political freedom. Clearly it is not a sufficient condition. o The only way that has ever been discovered to have a lot of people cooperate together voluntarily is through the free market. And that’s why it’s so essential to preserving individual freedom. 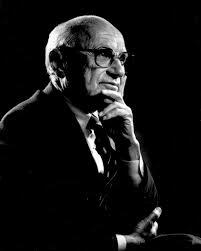 To learn more about Milton Friedman and his work, please click here. Here’s a direct link to Part 1.